In my last post I rounded off by saying how important it was to be the hard to please type. And so it was today. As I warmed up – running the 4 miles from Marcus Garvey Park in Central Harlem after Sham had driven us in – I fixed my goal finish time of sub-21:00 in my mind. So you’d think that my 20:55 finish time would have made me happy as Larry. But it didn’t. Race conditions were ideal. A gentle breeze, bright sunshine and temperatures hovering around 60F. My warm-up, a repeat of what I did for the Scotland Run 10K, suggested my legs were well rested after a tough few weeks in mid-May. The only cloud fogging my mind was my ongoing IT band ‘issue’ which for the last few months appeared to have triggered some ankle swelling. The fat ankle had prompted me to visit Dr Stu on Friday and he’d worked his usual magic. Many runners were decked out in club colors from yesteryear in keeping with the retro race theme. Some Warren Street team mates did the same but also in honor of our recently departed all time best runner Pat Petersen. Runners respected a moment’s silence in his memory. Pat died at just 55. 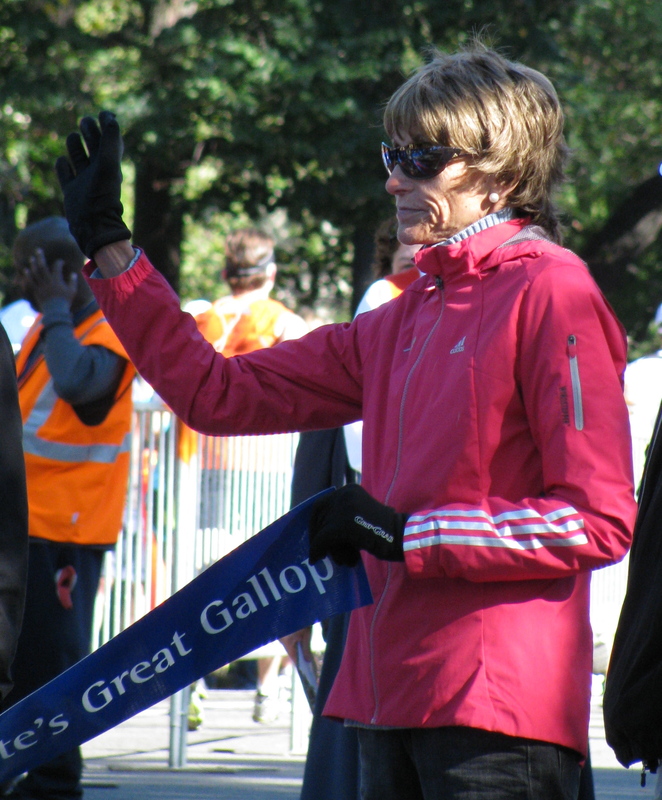 He was a former U.S. marathon record holder and top 5 at three New York City marathons. I never had the privilege of meeting Pat but somehow feel like I did. He set a very high bar as a husband, father and runner. Thinking of Pat – how he so completely dedicated himself to running, how he achieved so much, and yet how he was in all other ways just a regular kinda guy, husband and father with no airs and graces – it seems he lived my favorite Tibetan proverb “better to live for one day as a tiger than to live for a thousand years as a sheep”. To honor Pat the only way a runner can meant I had to hurt today. I started out much slower than the last time I did the last time I raced this 4 mile course. I buried myself deep in the pack and passed the mile mark in 5:12. Matt Chaston, perhaps the New York area’s fastest runner over 5K to 5 miles for M45-49 , was almost 10 seconds ahead of me. I hoped I could reel him in during the hills in the third mile. Matt, born in Wales but New York resident for many years, comes from great running stock. His brother Justin, also Stateside living in Colorado Springs, ran for Great Britain in 3 consecutive Olympics. 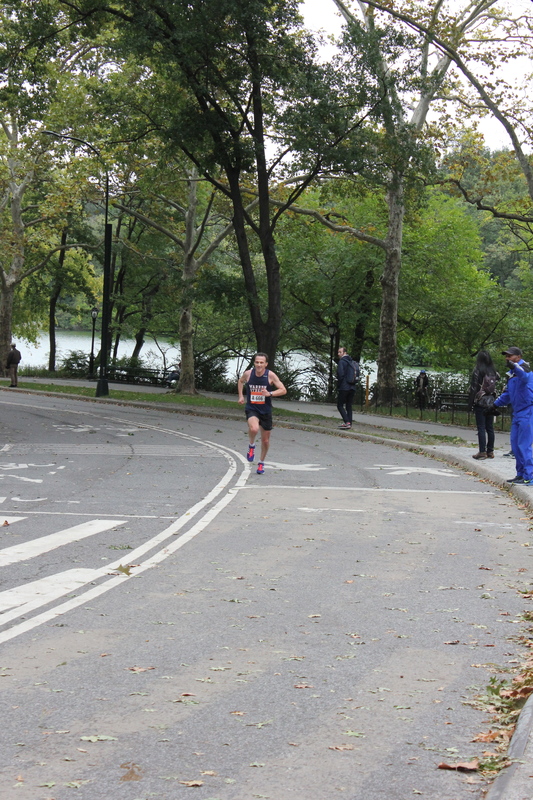 I tracked a group dominated by Central Park Track Club (CPTC) runners. They passed 2 miles in 10:20 and had been closing on Matt. I was working hard, too hard. That proved to be my downfall. As we turned left off the 102nd Transverse onto the East Side Drive and started the gentle climb towards the third mile mark I started to drop off the group. At mile three the clock read 15:45. In the final mile the course gently descends. This saved me from unravelling further. As I straightened up after taking the final turn – a 270 degree left hander – I saw the clock reading 20 something and sub-21:00. I dug deep and the body responded. I crossed the line in 20:55. Matt was 9 seconds ahead of me. He’d only previously beaten me once before – in the Central Park Conservancy Run for Central Park in July 2011 run on the same 4 mile course. So I finished in 20:55 for 26th overall and 2nd M45-49. There was some consolation in gaining the top age grade of 91.40%. Warren Street’s masters team finished second to CPTC. Danny Tateo was 1st M50-54 in 22:28, 40 seconds ahead of his nearest challenger. Our masters team are still just ahead of CPTC in the year to date rankings but 2015 promises to be battle that will go to the wire. Sam Lynch, 7th overall in 19:23, led us to 4th place open team.